These instructions will help you get started quickly with Attendize. into your document root on your webserver. Make sure the public folder of the project is the document root of your server e.g. /somepath/public where public is the public folder of the attendize project. Make sure the following files/folders are writable by the webserver user. Failure to get permissions correct can cause Attendize to not work correctly. When browsing to the installer page in the last step the installer will double check permissions however if you don’t set the correct permissions below you won’t be able to get to the installer. Change the folders below to be owned by the webserver user. www-data is used below but your web server may differ. 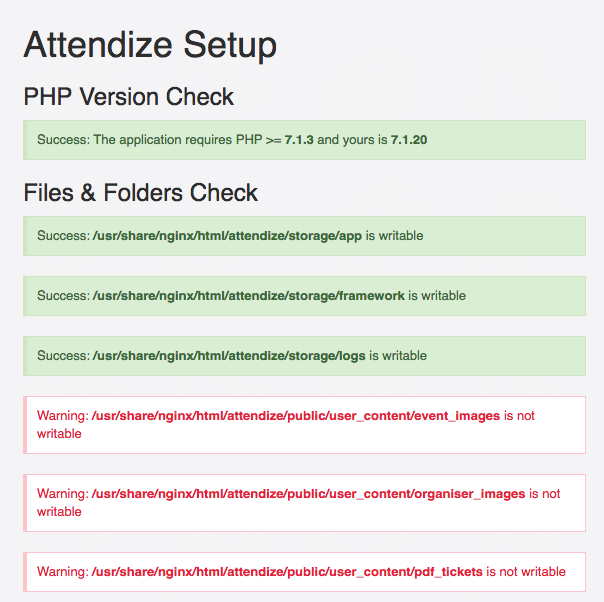 Attendize uses the Laravel framework so you need to generate an application key. Create a MySQL database that you will use for your installation of Attendize. You will need to enter these details on the installation screen. If you do get the installer screen like below but there are errors please correct them before trying to proceed and install Attendize. Once you have corrected the errors simple refresh the page so the installer can run the checks again. You will need to enter your database connection details and mail settings to configure Attendize correctly. To get developing straight away use the pre-configured Docker environment follow the steps below. 1. Download the project off Github. You will need to have git installed to clone the project. 3. Make a copy of the laravel environment file. It can be useful to set APP_DEBUG=true to help you debug any issues you might have. 4. Set permissions correctly on folders which need to be writable. 8. Run docker-compose up to create the development environment. You can drop the -d flag to see output from the containers which is useful for debugging. You can follow the web instructions to continue installing Attendize. If you are comfortable on the command line you can run Step 9 below and skip the web installer. Attendize should now be available at http://localhost:8080 and maildev at http://localhost:1080 to see the emails Attendize sends. Which version of Attendize do I use? To decide what version of Attendize you should use is primarily based on what payment provider you use. Attendize uses Omnipay for payment processing which is a open source payment processing framework. The laravel 5.2 branch supports Omnipay v2 and version 1.1+ supports v3 of Omnipay. This list of supported payment gateways shows which payment gateways are supported with Omnipay v2 and Omnipay v3. If you use a payment gateway listed under Omnipay v2 uses this version. If you use a payment gateway listed under Omnipay v3 use this version.